The young virtuoso violinist Miranda Liu has been praised by audiences and critics alike for her “perfect” (Oberbayerisches Volksblatt) and “brilliant” (Salzburger Nachrichten) technique, as well as for her mature and compelling interpretations. Her extensive musical knowledge is apparent in her performances of master works from the Baroque, Classical and Romantic eras, to the fresh new works of present day composers. She has performed on numerous concert stages throughout Europe (Austria, Germany, Hungary, Belgium, Czech Republic, France, Italy, Lithuania, Poland, Portugal, Romania, Slovenia, Switzerland, UK) and the USA. Her prodigious talent has resulted in her winning first prizes at many music competitions and playing in hundreds of recitals and concerts around the world. Since her first solo appearance with orchestra at age eight, she has gone on to solo with orchestras such as the New World Symphony in Florida, the Rhode Island Philharmonic, the Las Vegas Philharmonic, the National Radio Orchestra of Romania, the Philharmonisches Orchester Budweis, the Philharmonie Salzburg, the Neues Sinfonieorchester Berlin, the Starling Chamber Orchestra Cincinnati, and the Old York Road Symphony in Pennsylvania, among others. She regularly performs at prestigious music festivals and master courses worldwide, and works on an extensive and broad repertoire with the most renowned music pedagogues. The recipient of numerous awards, she received 1st prize and the special prize for the "best interpretation of a required work by a contemporary Hungarian composer" at the 2014 Ede Zathureczky Violin Competition (Budapest), Gold Medal at the 2014 Forte International Music Competition (New York), 1st prize at the 2013 International "Music without Borders" Competition (Hungary), 1st prize at the 2012 New World Symphony Young Artist Concerto Competition (Florida), 1 st prize at the 2011 Rhode Island Philharmonic Orchestra Concerto Competition, 1st prize at the 2011 Las Vegas Philharmonic Young Artists' Competition, 1st prize at the 2009 American Protégé International Piano and Strings Competition (New York), 1st prize at the 2008 Old York Road Symphony Young Artist Competition (Pennsylvania), 1st prize at the 2005 Delaware Valley Philharmonic Orchestra Youth in the Arts Competition (Pennsylvania), 2nd prize at the 2014 New York International Artists Violin Competition, and 2nd prize at the 2011 International Competition for Young String Soloists Bischofszell (Switzerland). 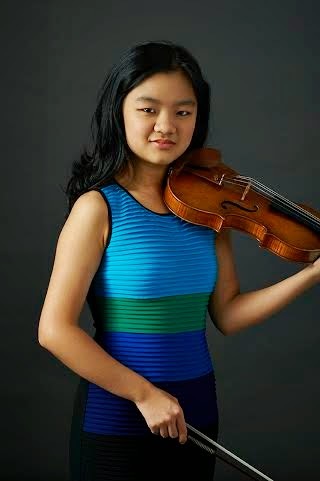 She was also a finalist at many competitions, such as the Philadelphia Orchestra’s Greenfield Competition, the Concorso Ruggiero Ricci Salzburg, and the Jefferson Symphony International Young Artists' Competition (Colorado), as the youngest participant. Miranda Liu began early musical studies with her pianist mother and subsequently received her first violin lessons at age four. At ten, she began studying with Prof. Paul Roczek at the Universität Mozarteum Salzburg where she was a member of the Leopold Mozart Institute. At 14, she officially commenced the Bachelor of Arts Degree Program (Violin Performance) at the Mozarteum. Additionally, since 2011, she began working privately with Prof. Eszter Perényi in Budapest and at the Ferenc Liszt Academy of Music as a scholarship holder in the Erasmus Exchange Programme. She currently divides her time between Europe and the USA. Miranda performs on a rare violin made by Nicoló Amati in Cremona, c. 1676, and a violin made especially for her in 2014 by Samuel Zygmuntowicz in New York.